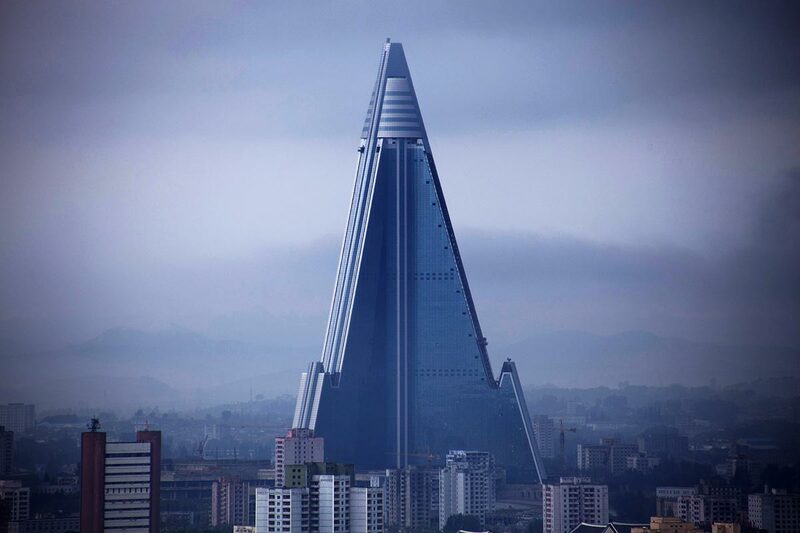 Look at almost any photo of Pyeongyang, North Korea, and you’ll see it—the enormous pyramid that is the Ryugyong Hotel, nicknamed the “Hotel of Doom” because it looms over the capital like the Eye of Sauron. Construction began in 1987, then ceased several times due to famine, poverty and other major problems with the notoriously closed-off country. But this week, after literally three decades of stop-and-start construction, workers have taken down the construction walls surrounding the hotel, revealing a bright red-and-white letter sign that says “Rocket Power Nation,” signifying that it could actually soon open. It might not be a coincidence that all this is going down at the same time as the United States announced a travel ban for all Americans to North Korea starting September 1, 2017—an initiative by Donald Trump’s government to staunch valuable Western dollars from going to Kim Jong-un. Between all this chest-puffing from both sides and Korean test missiles flying into the ocean, Western news consumers might be tempted to think all this signals some impending world war. But don’t worry—having lived in South Korea for two years, I can confirm that this is business as usual, and Kim Jong-un knows as well as anyone that if anything serious actually happens, they cannot win World War III. Speaking of flight rights, our senior editor this week penned a heartfelt plea to flyers around the world to stop being jerks to flight attendants. And sure enough, literally hours later, a Budapest-bound Air Canada flight carrying 267 people didn’t even make it past Nova Scotia before having to turn back to Toronto because some dope allegedly got drunk and assaulted a flight attendant. Police arrested the 57-year-old man, who was charged with uttering death threats, aggravated assault and endangering an aircraft while in flight. The flight attendant, meanwhile, was taken to the hospital with minor injuries. Lastly, Switzerland just opened the world’s longest suspension foot bridge—and it looks horrifying. At 494 metres (1,621 feet), it allegedly cuts at least three hours off the two-day Europaweg hiking trail, according to a Swiss tourism official. Watch a nearly two-minute-long video pan of the bridge, seemingly shot by Stanley Kubrick, above.